Thanks to MIT’s Tangible Media Group, interfaces that bend, hinge and curl will soon be a reality. Imagine if your iPad case automatically lifted up each time you received a message, or your Post-It notes folded down as you checked an item off your to-do list. Well, that may soon be a reality thanks to a team from MIT’s Tangible Media Group who has unveiled a technology for the rapid digital fabrication of customized thin-film shape-changing interfaces. By combining the thermoelectric characteristics of copper with thermally sensitive polyethylene, the researchers were able to actuate the shape of the flexible circuit composites directly. 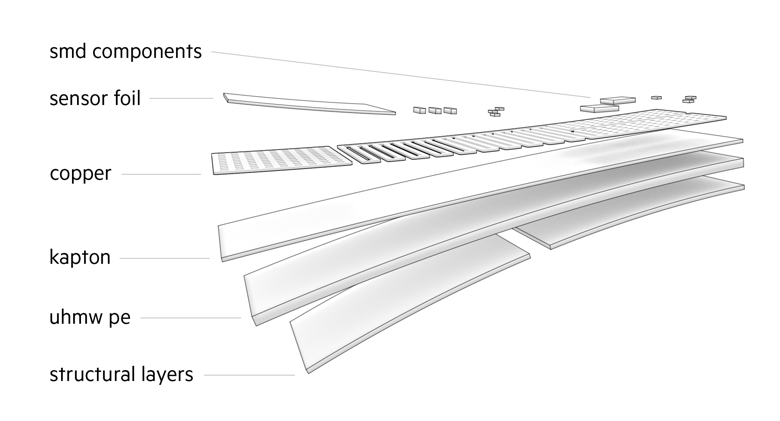 The development of UniMorph can be broken down into a few steps, which begins with designing a digital model of the pattern in CadSoft EAGLE or Adobe Illustrator and then fabricating the structure using a standard printer, copper etching, hydrogen peroxide and hyrdochloric acid — the entire process is explained in great detail here. The base of the interface is made up of two thin layers of material: Kapton on top, plastic polyethylene on the bottom. When these are heated up either using a third layer of copper conduits or exposure to light, they expand at different rates. This will cause the bottom layer to pull up the edges of the top, thereby creating a curling effect. Passive actuation can leverage access heat, like that given off from a lightbulb or the sun, to create simple shape transformations. 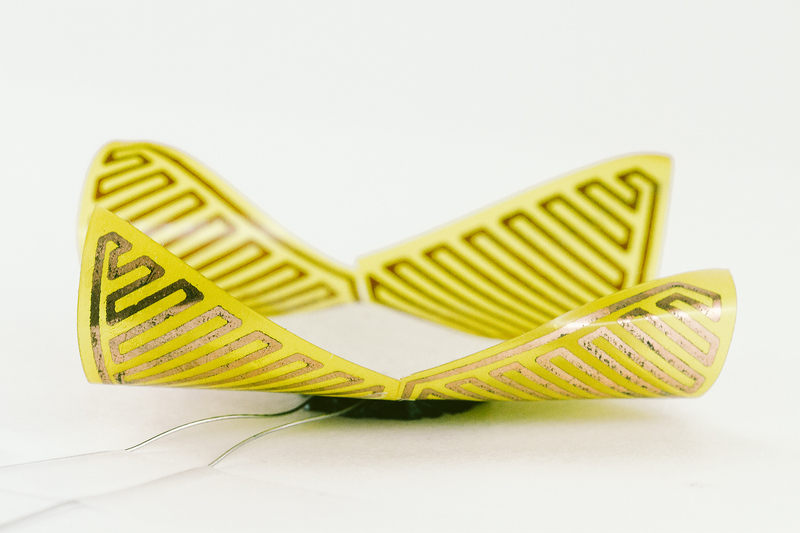 Meanwhile, more complex and active shape-actuation can be achieved by designing resistive heating patterns into a flexible circuit. The uniMorph composite also allows for the embedding of additional electronics such as sensors, LEDs and MCUs. Not only can the film bend, curl, twist and open like a flower, but uniMorph’s unique capabilities unlock the potential for things like the aforementioned smart Post-It notes and iPad covers, as well as responsive bookmark/reading lights that bend into place as you navigate the page. According to Creative Applications, the listed examples each run on custom Arduino-compatible boards, and in some cases, the flexible circuits are produced in such a way that the ATmega328P can be soldered right on top. Intrigued? You can read all about the project in its paper here, or simply check out its video below. This entry was posted in Design Trends and tagged Arduino, ATmega328P, MIT media lab, Shape-Changing Interface, Tangible Media Group on October 12, 2015 by The Atmel Team.